Thank you for joining us for Animal Antics and we hope you will all join us again this week too. I'm afraid I took the cheat way out and went for a CAS with plenty of white space. 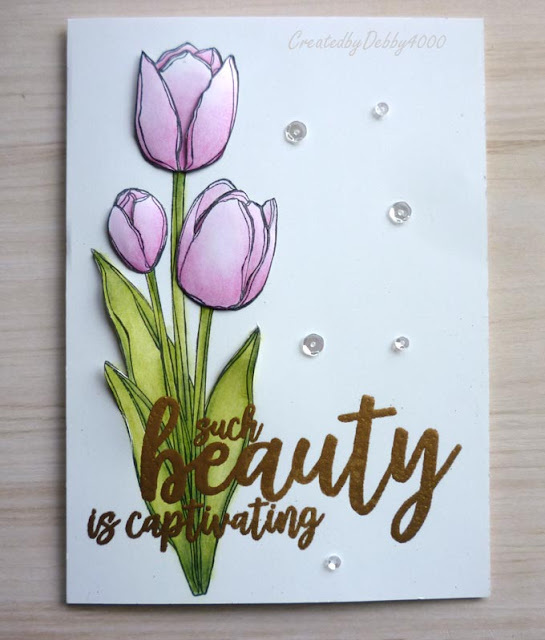 I stamped the Simon says Stamp Sketch Tulip Bouquet and made sure I coloured the leaves with some shading but I layered up the tulip heads. It was then I used the Picket Fence Happiness Belong to You and used one of the large sentiment with Simon says Stamp Antique Gold embossing powder so it would stand out of the green stem. Then with a craft knife I cut the leaves and added 3d foam square cut down to fit the top of leaves so when I stuck it on a card it lifted the leaves. The tulips heads were layered in the normal way and I added some sequins since all that white space annoyed me! Those tulips are beautiful! Love that you lifted the leaves a bit. I can imagine how it adds to the dimension. The sequins add a nice bit of sparkle, too. 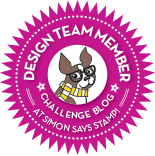 Gorgeous design and I love the gold embossed sentiment, Debby!